The case studies included in the SITR come from the collection of over 80 studies collected under the International Partnership for the Satoyama Initiative (IPSI). These case studies are all in some way related to the basic concept of the Satoyama Initiative and are searchable and contain a wealth of information, but, as implied above, due to the sheer volume of data it could be difficult for someone to find lessons relevant to their own work without already knowing in advance exactly what they were looking for. To help with this potential problem, the SITR was created as a publication series in which each volume would collect a number of the case studies around a given theme, including synthesis and analysis of lessons learned from the cases. The theme for the first volume is “Enhancing knowledge for better management of socio-ecological production landscapes and seascapes (SEPLS)”, focusing in particular on tools and approaches used by and with local communities and other stakeholders in the landscape. Perhaps of most direct interest to Cultural Landscapes Blog readers among the case studies in this volume is the one on “Landscape conservation in the Black Forest, Germany” by colleagues at the German Association for Landcare (Deutscher Verband für Landschaftspflege, DVL) and the Landcare Association Central Black Forest. 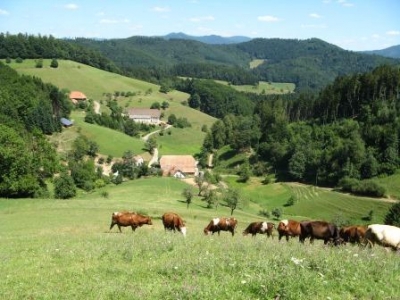 Most readers will probably be aware of the Landcare approach to restoration and management of cultural landscapes, and its specific application in the Black Forest area provides a number of benefits in terms of biodiversity, ecosystem services, awareness and others. 1. Value articulation – this is particularly relevant when there is a risk of a bias toward either natural or social systems due to users’ backgrounds or fields of study. 2. Knowledge creation – a more comprehensive understanding can often be gained through periodic use of tools in a region. 3. Policy advocacy – decision-makers are often thirsty for concrete information that can be gleaned from case studies. 4. Awareness-raising - better awareness among different types of stakeholders can lead to effective management strategies. 5. Better networking – this in turn can lead to various desired outcomes such as development of high-value market products. 6. Better understanding of trade-offs and synergies – this is especially important when there are very diverse stakeholders with different interests. 1. Select and design tools and approaches to fit into the local context – flexible tools that can be customized to local contexts can be valuable for this purpose. 2. Understand local contexts first – this can involve building trust over a period of time, and especially, listening to local stakeholders. 3. Find entry points to local communities and ensure wider engagement – for this point, a key partner within the local community can be absolutely vital. 4. Familiarize the community with tools and approaches, and make objectives clear – insufficient understanding of their purpose can cause serious limitations. 5. Sufficiently consider pros and cons of using different tools and approaches – this can also involve reflection on one’s own assumptions about the landscape and potential impacts. 6. Ensure capacity building – fully involving local communities can both empower the communities and facilitate upscaling. 7. Provide feedback – this can facilitate further action, while it is also important to clarify the ownership and continuing use of any knowledge gained in the landscape. 8. Feedback cycles: adjust tools and approaches after implementation – this also helps to clarify and resolve challenges that arise during implementation. These key insights themselves are explored in greater depth in the publication; they are listed here as an example of the kind of findings that can be extracted through processes of analysis and synthesis carried out on case studies after they have been collected. These processes can be labor- and time-consuming, but if those responsible for case-study collection want to make their information useful for as many others as possible, the work more than pays for itself. For a counter-example, just imagine each individual reader trying to sort through eleven or more case studies and ending up with the findings listed above. Much more information on the findings, the case-study collection and analysis process, plus the case studies themselves can be found in the publication, which is available for download on the IPSI website. Anyone involved in landscape approaches is encouraged to look at it. The second volume of the SITR, with the theme “Incorporating concepts and approaches of socio-ecological production landscapes and seascapes into policy and decision-making”, is now under development, and readers can expect it toward the end of this year. Thanks to Marie Kaerlein of DVL for her help in preparing this post.